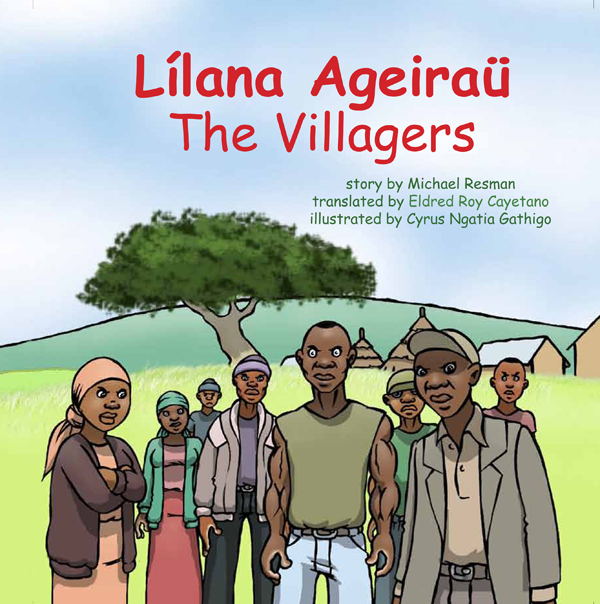 The Villagers was written by Michael Resman, translated into Garifuna by E. Roy Cayetano, iillustrated by Cyrus Ngatia Gathigo and published by Producciones de la Hamaca, Caye Caulker, BELIZE - 40 pages (2012). It is a translation of the second book in the Whispers of the Holy Spirit series of children's books. wanted to publish it in English and Swahili with illustrations by an African artist. In Kenya, Judy asked Douglas Mmbala Shikuunzi if he knew any artists and he recommended	Fred Senelwa, who brought Cyrus Ngatia Gathigo into the project. Fred did the translation	for the Swahili version and Cyrus painted the illustrations using Photoshop. In Belize, Dorothy Beveridge did the layout of the book in InDesign and the Swahili version	of The Villagers was published. The Villagers was greatly admired for both the message and	the beautiful paintings, so we asked Belizean linguist Eldred Roy Cayetano to translate it	into Garifuna, an indigenous language in Belize. and to Eldred Roy Cayetano for the Garifuna translation.